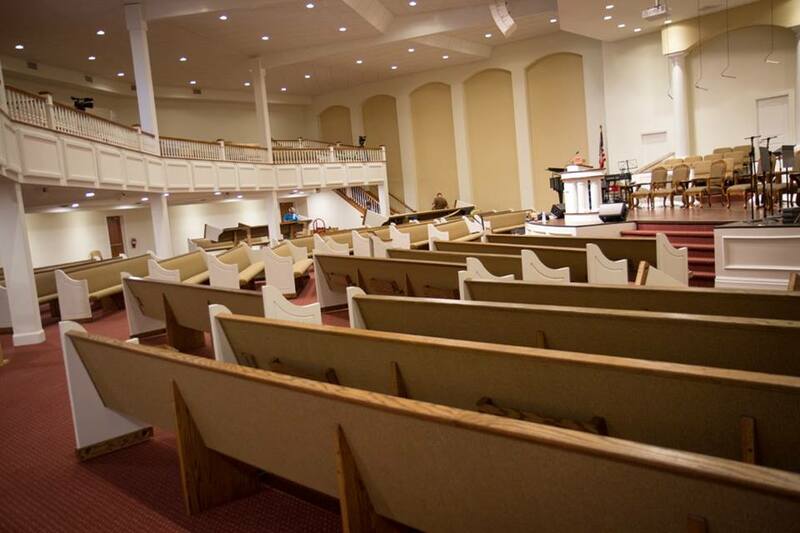 Oak Grove Baptist Church in Eros, Louisiana just received some much needed new church pews. 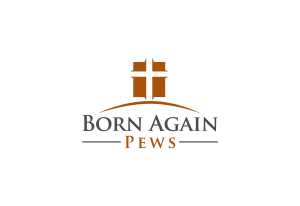 It was a privilege to serve the Lord by installing new church pews for the church and help spread the Word by helping Oak Grove get new affordable pews so they can spend some money elsewhere on missions. Eros, Louisiana was founded by the Tremont Lumber company where they built a sawmill for their logging operation. Because the sawmill was the center of activity, Eros became a social center for the area. Although a small town of only 202 people today, Eros was once a large bustling town of over one thousand residents with three hotels, a post office, a newspaper, three doctors, three churches, a company commissary, a drugstore, a bank, a telephone exchange, and a high school. Eros was named after the asteroid that was discovered in 1898 and was a shining star in Louisiana where two former university presidents had ties. In fact, LSU former president James Monroe Smith taught at the high school during the 1911-1912 academic year. But in 1920, a cyclone hit Eros and destroyed the sawmill that brought life to the area. It was rebuilt and then burnt to the ground only six years later. Tremont Lumber was finished logging in the area, however, and decided to rebuild in Olla, Louisiana. Another interesting thing about Eros that’s not commonly known is that during its time as the social center, it was the hot spot for Box Suppers. Box and Pie Suppers are a southern tradition to raise funds, usually for churches and other groups, where people bid on a supper or pie and if they won the auction, they would usually have the honor of being able to eat their winnings with the person who made it. The identity of the baker or cook was kept a secret but the Box Supper was a popular institution for courting and lead to many a marriage! While Box Suppers might have gone by the wayside, we were happy to install new church pews in the Oak Grove Baptist Church in Eros, Louisiana. 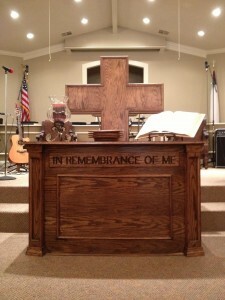 We also installed a new communion table for the church that matches their new pews in style and color. Although times have changed for social events, if you’re looking for a creative way to raise money for your church pews, take a note from Eros and try a Box Supper or Pie Sale!